My name is Sarah and I am the class teacher. Gemma is our TA2 and my second in command. Anne, Vicky and Lianne complete the team as full time teaching assistants. But the most important people are the children - Alisha, Bruno, David, Ismaill, Jake, Lawrence, Luca, Rosie and Naomi. Our topic this half term, is Splish Splash Splosh. We will be exploring water wherever we find it, in nature and around the school. We will carry out experiments about waterproof materials for science, we'll design umbrellas in art, and we will work on capacity in maths. Our books for Literacy are Mr Gumpy's Outing, and Mrs Armitage and the Big Wave. We are all looking forward to visiting the paddling pools at Cassiobury Park in Watford. More details on that, soon. We had a really fantastic day at Cassiobury park. The children were absolutely brilliantly behaved and had a great time. Those children's parents were really impressed with our pupils. Every child in green class really demonstrated the social and emotional progress they've made this year. A lovely day. We're having lots of fun with our new topic. The children designed their own umbrellas, and this afternoon we tested an umbrella and a tent to see if they were waterproof. 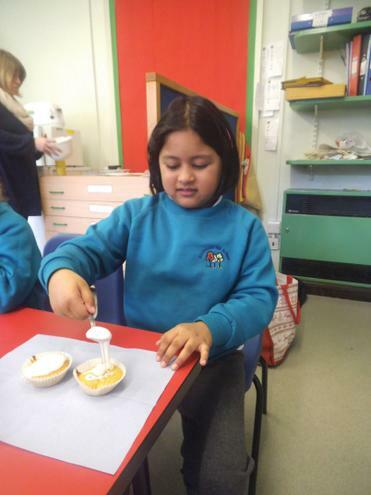 The children in Green class designed heir own fruit and yoghurt dessert. They had a lot of fun mixing the yoghurt with sauce to flavour it, and then making their layers of flavours and fruits to match their design. They then chose a topping. Alisha called it "the finishing touch"! Everyone enjoyed eating their dessert at the end. This half term, our topic is 'Down on the Farm'. 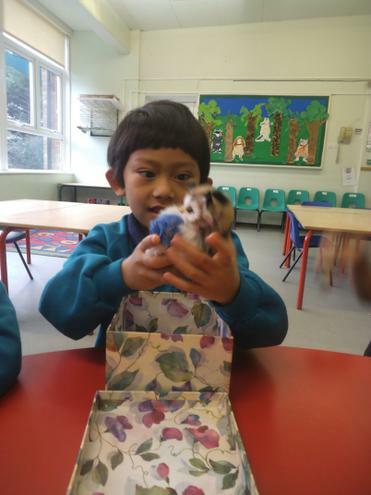 We will be going on a trip to a farm, and finding out about where our food comes from, and about how baby animals grow. We will also find out about farm machinery and keeping safe around vehicles. We had a fantastic trip to mead open farm last week. Every single child loved it, and they were all very confident, happy, and gentle with the animals. It was a real treat for the adults to see them all so happy and involved. Each pupil got to feed the lambs and help groom the pony. This half term our topic is 'Making Sense'. 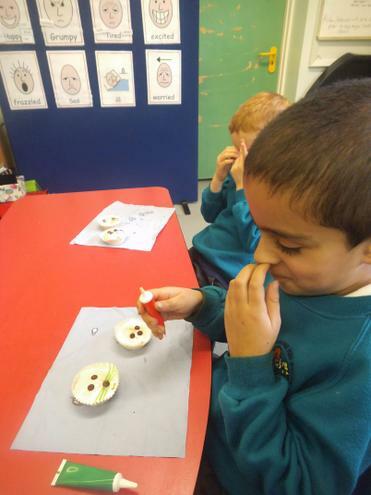 The children will be learning about their senses, so we will be doing lots of tasting, smelling, listening, looking and touching. We will be having lots of sensory fun, and will be making and enjoying as many different types of messy stuff as we can! We will also be making a class sculpture, so watch this space!. The children in Green class finished our Book term story topic by writing book reviews about There's a Shark in the Park. Some used symbols to say what they thought, some dictated their thoughts to an adult and then over-wrote or copied the adult's writing, and some wrote their thoughts down by themselves. Here are some of the results. We've had a lot of fun with our tasting week. Vicky brought herbs from the garden for us to taste, and we tasted lots of things to work out what was sweet and what was sour. We made pancakes (a week late!) with lemon and sugar. Yesterday we made jelly, and today we tasted the different flavours to see which we liked best. Then it got messy! 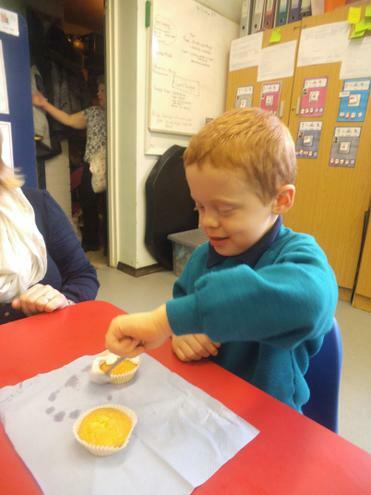 The children used their jelly for sensory play, and felt how cool and slippery it was. They put jelly hair on laminated photos of themselves, and then we tipped all their jelly into the tuff spot for them to squish and mix up. They had a lovely time! Also, take a look at the latest news section on our home page. We've shared our recipe for the coconut scented play dough that your children made and brought home. They enjoyed making it and our hands were lovely and soft and scented afterwards! 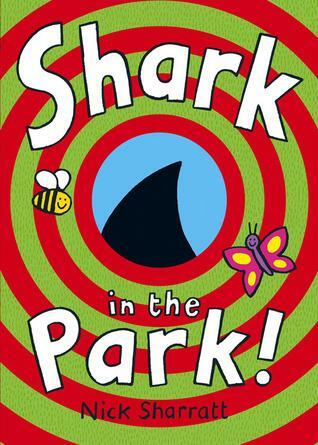 In literacy green class are reading 'There's a Shark in the Park'. "Timothy Pope has a brand new telescope and he's testing it out at the park. Children will delight in guessing what Tim has spotted. Is that really a shark he can see?" 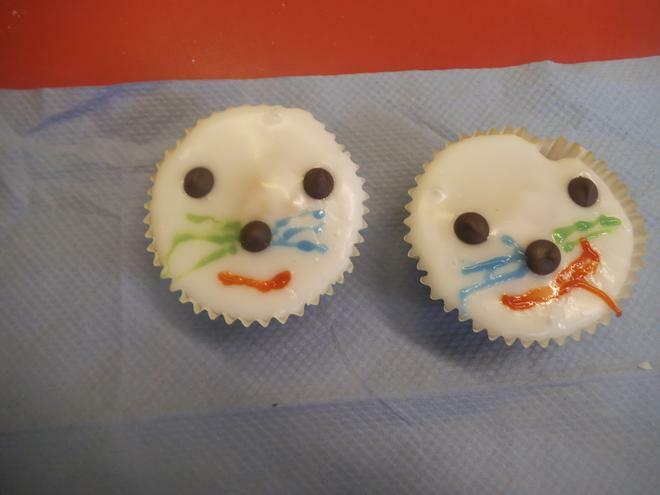 Green class have definitely got into the spirit of our 'Making Sense' topic. Our first week on 'touch' saw us investigating all sorts of different surfaces. 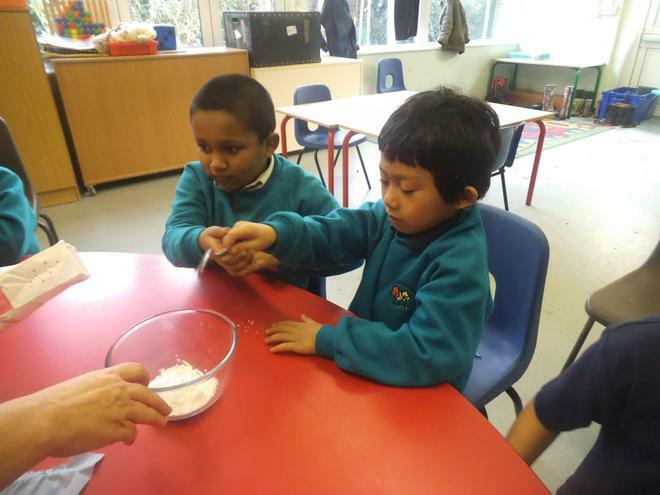 We rubbed flour and butter together to make apple crumble, and we finished the week by having our first of five different types of sensory messy play. 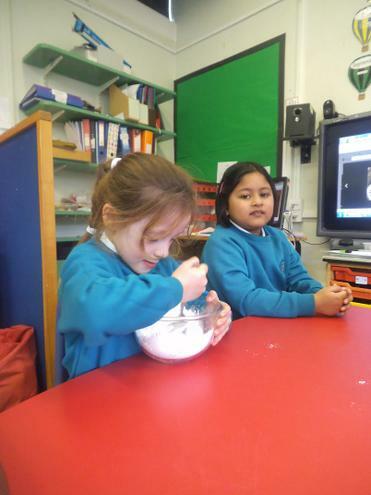 The children really enjoyed playing with shaving foam, and adding food colouring to it. 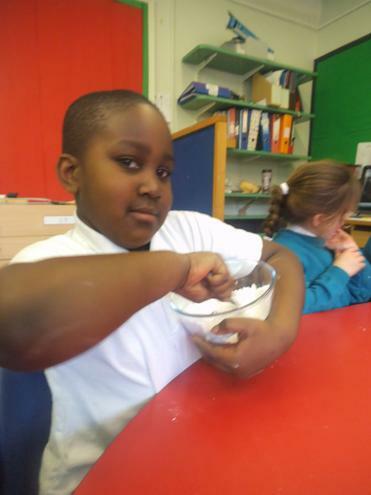 This week we will be using 'soft mud' made from toilet tissue and grated soap. Hopefully that means hey will come home smelling as lovely as they did after shaving foam afternoon! This week is smell week. We're going to make vegetable curry and smell lots of different spices, as well as trying to identify lots of different aromas on other days. We will finish with hand massages in the light sensory room, with the children choosing their favourite hand cream or body butter. It has been a really busy half term, and a very creative one! 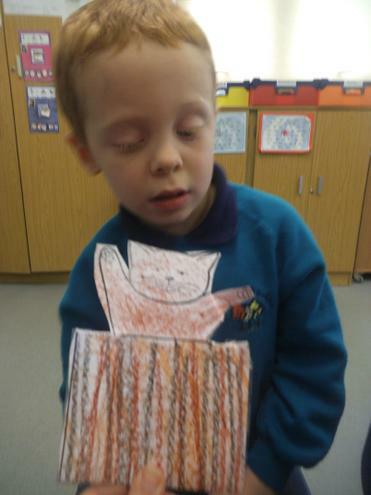 Our books and our topic story have given us lots of stimulus in art, craft and drama, as well as teaching the children about their emotions and giving them increased reading skills. 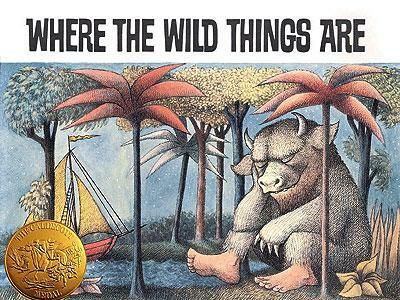 We will finish the half term by performing our 'Where the Wild Things Are' story to Blue class - so look out for the photos, which I'll put up on the site as soon as I can. Below, is a sneak preview of the children in their costumes. We have really enjoyed having Nikki with us for the last four weeks. She has provided the children with some really fun and stimulating learning activities in her lessons, and they've made very good progress. Thank you Nikki. We'll miss you, and we wish you all the best in your teaching career. Today was the big day of our performance of Where the Wild Things Are. After lots of rehearsing, we invited Blue Class to be our audience. The children did really well, remembering all their cues, and putting their all into "roaring their terrible roars, gnashing their terrible teeth, and showing their terrible claws". They danced their way through the wild rumpus, and went to sleep when 'Max' told them to. All the adults were very proud of them, and Blue class were a great audience. We hope you enjoy the photos. My apologies for the poor quality of some, but it was difficult to direct and take photos at the same time! What a busy afternoon in Green class! As part of our 'Where the Wild Things Are' topic, the children made their own Wild Thing faces on paper plates. They followed instructions and made their masks as much like their chosen wild thing character as they could. The results were fantastic, as you can see! Luca even got a special sticker from Jill. Where The Wild Things Are - Art. A video adaptation of the Maurice Sendak classic. We peeled potatoes, and cut broccoli into 'trees'. After cooking them, the children mashed the potato, grated some cheese, and put everything together to make a healthy pie with a Wild Things forest theme. 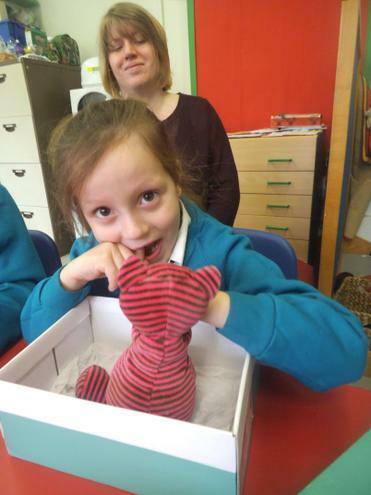 Everyone in Green class is enjoying our literacy story 'My Cat Likes to Hide in Boxes'. 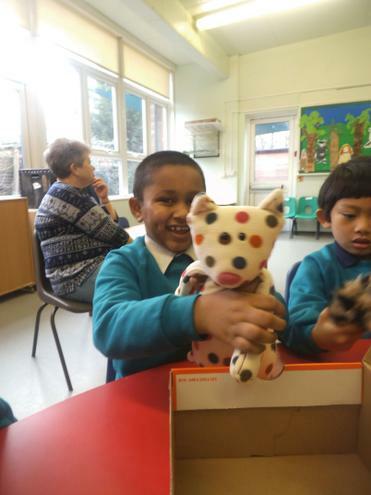 When it was their turn to say the repeated phrase, each pupil loved opening their own box to find a soft toy cat hiding inside! 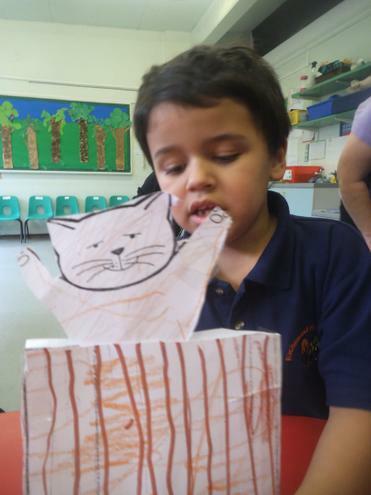 We've made pop-up cats in boxes,and cat cakes in cookery. 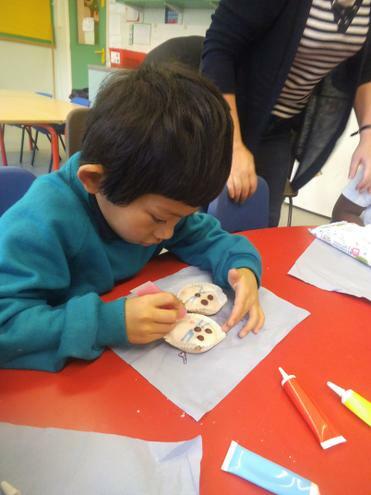 Next week Nikki will be teaching the children about different materials,and they will each decorate a box, using materials with different textures. Maybe there will be a cat in those too! For fun, we have been watching the videos of Maru the cat, who loves boxes! You can find him here, and on several other videos on youtube. In numeracy at the moment, we are exploring sorting and patterns. The children have been sorting items into colours and sizes. They have copied or continued patterns started by the adults, and have made patterns by themselves. 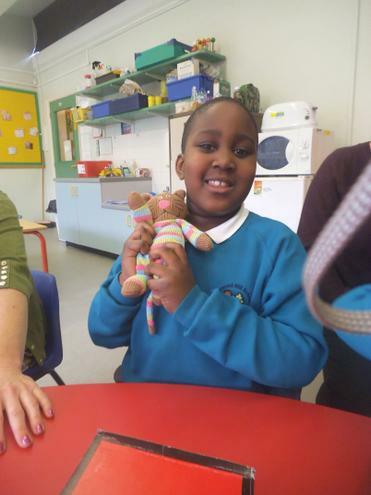 As you can see, we've made some lovely strings of beads, and patterns with pegs and compare bears. Everyone has enjoyed this maths topic, and some have been very creative!